Buy One Get One Free Lessons to all new students, call now on 023 8065 8373! Toby Janes has toured the UK in a multitude of bands and as a highly in-demand session musician. His skillful, professional and methodical approach to the drums has seen him gain 15 years of recording experience in some of the best UK studios with top UK music producers. It is this experience and skills acquired over a long career that makes Toby one of Southampton’s most sought-after teachers’ Toby is a regular on the live scene throughout Southampton, Bournemouth and the surrounding Hampshire and Dorset towns. Session drum work has taken the drummer on tour from London, to Bristol, up through Wales and into the highlands. Not to mention two tours through sunny California! Toby is currently available at River Studios on Tuesday and Saturdays. 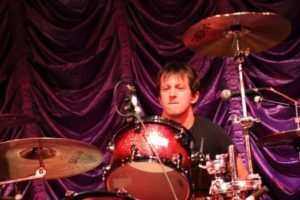 Playing drums since 1987 and teaching drums since 2003, John Lezana has played with many bands of different styles: Rock and Blues, Indie Rock, Prog Rock, Psychedelic Rock, Function Bands and currently plays in a Pink Floyd tribute band playing all over the UK, Ireland and Europe. A real passion for teaching drums, playing drums and everything drum related. John is also the author of: 50 ways to play your rhythmic phrase. Sam Garnett, has over 18 years playing a variety of different genres and styles, from Rock and Metal to Funk and Jazz and even a bit of Country and Western. He has toured across the UK from Hampshire/Dorset up through the midlands and even up to Scotland as well as worked as a session musician for studios in Southampton and London but his home is in the local live music scene where you may find him as a house drummer for various open mics. Sam is currently available at River Studios on Wednesdays and Sundays, accepting students of all ages and abilities. Our teaching facilities in Southampton are more than equipped to deal with even the loudest of drummers. We have three, soundproof, acoustically treated rehearsal rooms that are ideal for any musician, especially drummers and louder acts. Rehearsal rooms are equipped with a full PA, Drum Kit, Microphones and Amps. So all you’ll ever need for your lessons will be drum sticks and the energy to smash away! We also offer guitar lessons for beginners, bass guitar lessons and singing lessons at River Studios in Southampton.